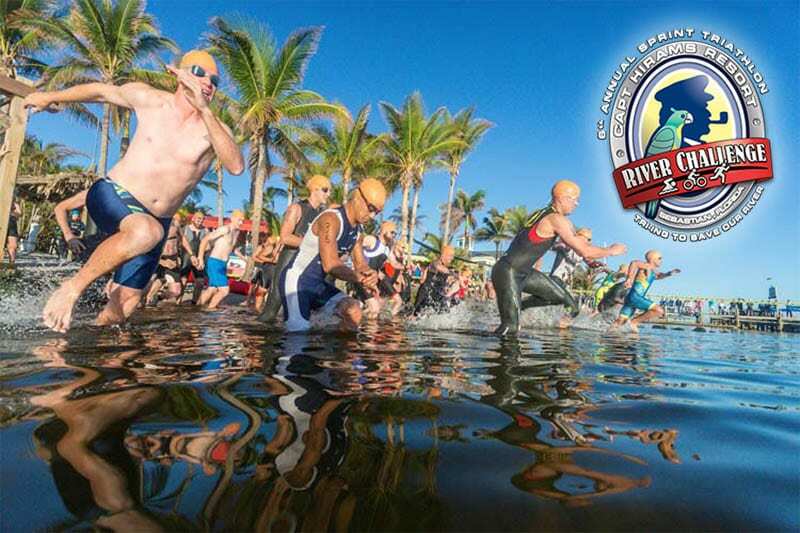 On November 18th, 2018, the sleepy fishing community of Sebastian, Florida will be filled with triathletes of all ages and skill levels as Capt Hiram’s Resort hosts its 6th annual River Challenge Triathlon. The race is a fantastic opportunity to bring the family and participate in a community event benefiting one of our most valuable local treasures, the Indian River Lagoon. Growing rapidly in participation and fundraising, the River Challenge was created to raise awareness and benefit the overall health of the Indian River lagoon. The lagoon faces serious issues, including diminishing seagrass and populations of sea life, which are essential to its ecosystem. Careful monitoring and management are vital to the lagoon’s future. The River Challenge has been highly successful, raising $15,000 over the past five years. Proceeds directly benefit the lagoon and are distributed to key environmental groups including: CCA, the Coastal Conservation Association of Florida (www.ccaflorida.org), ORCA, The Ocean Research and Conservation Association (www.teamorca.org), and the Environmental Learning Center (www.discoverelc.org). For 2018, the focus is on executing a single-use-plastic free race. Eliminating water bottles, plastic cups, and Styrofoam plates are just a few of the improvements being incorporated this year. Capt. Hiram’s will also be incorporating these changes throughout the resort. Part of a fun-filled, family day, the race will begin at 7:30 a.m. at Capt Hiram’s Resort. It includes a .25-mile (400 meters) swim, a 12-mile (19 kilometers) bike ride, and a 3-mile (5 kilometers) run. The course takes racers through the City of Sebastian, proudly showcasing its picturesque waterfront. A post-race party at Capt Hiram’s Sandbar Beach Club will immediately follow, complete with live music, brunch, cocktails and an awards ceremony. To participate visit the Capt Hiram’s event page: www.hirams.com/triathlon. For more information, contact race director, Sam Vash at (772) 581-6179 or [email protected].